V okviru projekta TETRAMAX organiziramo uvodni tečaj testiranja uporabnosti ob upoštevanju uporabniško usmerjenega snovanja izdelka/aplikacije. Rezultati testiranja so koristni predvsem pri določanju funkcionalnosti novih produktov v zgodnji fazi načrtovanja ter pri odkrivanju morebitnih napak in pomanjkljivosti ciljnega izdelka/aplikacije. Testiranje uporabnosti se izvaja pri uporabniško usmerjenem snovanju proizvoda in praviloma poteka v več fazah. Posamezna faza se običajno večkrat ponovi, tako da se upoštevajo pripombe uporabnikov. Testiranje/izboljševanje se na nivoju posamezne faze ponavlja toliko časa, dokler ne dosežemo zastavljenih ciljev. Začetna faza testiranja ima obliko raziskovalne študije (angl. exploratory study), v okviru katere se ugotavlja, ali uporabnik razume in zna uporabljati posamezne funkcije testiranega objekta. Ob tem se beleži tudi pripombe uporabnika. Predmet testiranja je na nivoju nedelujočega prototipa, pri čemer so posamezne funkcije zgolj nakazane, ne pa še dejansko realizirane. Na osnovi rezultatov testiranja se izboljšuje prototip (spreminjajo se njegove funkcije, vizualni izgled in podobno). Naslednja faza je ocenjevalni test (angl. assessment test). Tu ima uporabnik že na razpolago delujoč prototip testiranega objekta. Za dano nalogo se beležijo podatki o uspešnosti izvajanja (v kolikem času je bila naloga opravljena, po kakšnem vrstnem redu opravil je bila naloga opravljena, in podobno). Večina rezultatov te faze testiranja je empirične narave. V tretjo fazo spada verifikacijski test (angl. verification test), katerega namen je izmeriti učinkovitost (kako dobro) in efikasnost (v kolikšnem času) delovanja danega produkta. Sem spada tudi primerjalni test s sorodnimi produkti konkurence. Predavanje bo v slovenščini. Kotizacije ni. Please help us spread the word and get as many responses as possible from people who use the bulletin. It will help us evaluate future bulletin redesigns and hopefully improve the safety of our mountains. Abstract: This paper describes the concept of virtual reality and the use of this technology in practice. The main part of the work is about reviewing the various stages of the development of a prototype system for interactive video management by means of an exercise bike. Systems, that are currently available on the market, are, due to their ease of use, closed units, for which upgrades are not possible or come at a great expense. The main advantage of the presented prototype, besides affordability, is a simple option to upgrade the system by adding sensors and/or modules; this allows us to extend the system in every stage of development. A low-cost computer (Raspberry Pi) is used as a processing unit, for calculating the speed of the wheel and sending this information to the control unit. The control unit processes the received data and sets the playback speed of the video clip accordingly. There is great potential for improvement on the developed prototype. Thus, ideas for further development are presented in the concluding section. Abstract: Since ancient times travelers and tourists try to leave their marks in places they visit. However, carving or writing on historic landmarks can cause irreversible damage on such sites. One possible solution are digital graffiti. These can for example be created through projection mapping where beams of light wrap the object with the digital graffiti created by users so everyone at the site can see them. However this may disturb other visitors being there at the same time. In this paper we explore an alternative solution for creating digital graffiti by utilizing Mobile Augmented Reality (MAR) technology. We developed a mobile application which allows users to: (i) select an object or a building, (ii) map a 3D mesh onto it in order to prepare its 2D plane , and (iii) draw a graffiti on this plane. After completing the drawing the application wraps the object or the building with a modified 2D texture creating an illusion of digital graffiti. 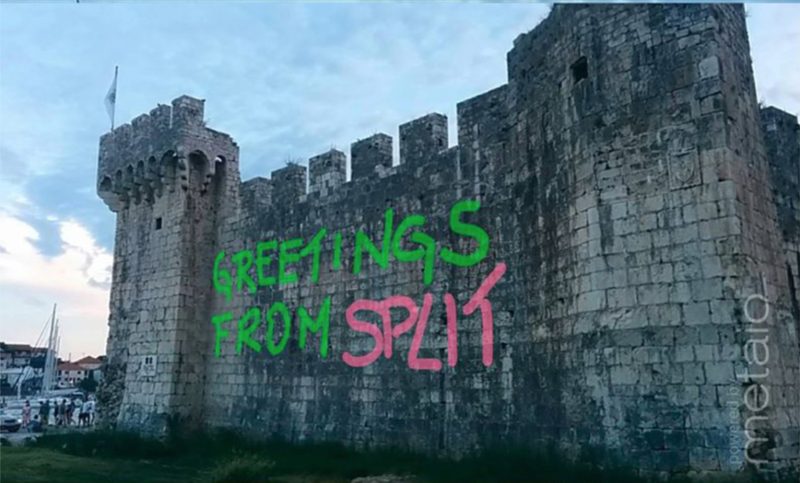 In order to (i) evaluate the social acceptance of placing digital graffiti onto historic landmarks and to (ii) evaluate if the use of our prototype is socially acceptable in public spaces, we carried out a small reflective user study. We created a couple of simple graffiti on different historic buildings and posted them on social networking site Facebook. Despite amateur appearance, posted photos received attention and generated some positive responses and questions. Abstract: In this paper, we describe first prototype of mobile crowd sensing device. The device serves as a source for signals in the potential crowd sensing studies. Presented device has no intention to compete with the existing mobile devices, such as mobile phones, but to complement them where they lack of the features like affordability, simple use and new opportunities in different segments of our lives. Our main goal was to develop a device, which can cover all aspects of mobile crowd sensing and at the same time to keep the device cost at very affordable level. The described device is capable of integration into most widely available sunglasses. The complete device consisting of two separate “lenses” forms distributed ecosystem serving as source for sound, light, acceleration and temperature signals while at the same time providing actuator function with integrated LED matrix display. Abstract: In this paper, we describe a case study of usability testing of the GUARD Control Desk graphical user interface, which is a part of the GUARD simulator and is used for exercise planning, execution and evaluation in soldier training. The usability testing was performed in the development phase of a new version of user interface. Abstract: With the ever increasing connectivity to the Internet the use of the web has spread from static environments of desktop computers to mobile context where we interact with the web though laptop computers, tablet computers, mobile phones and wearable devices. Recent studies have shown that young people access the web using various devices and input techniques and spend on average more than 20 hours a week on the web. In this paper we plan to investigate which input technology is most usable or preferred for performing different tasks on the web. We decided to compare and evaluate the usability of the three most used input devices for web browsing, namely: a computer mouse and a touchpad on a laptop, and a touchscreen on a smartphone. For this purpose we have built a custom web page where users had to perform seven common tasks on web: open a URL address, copy/paste a URL address, copy/paste text, scroll up-down, scroll left-right, zoom in the context of a web page, and navigate a map. The results show that the mouse is still a preferred input device with shortest completion times, followed by the touchscreen interface even if it performed slower at some tasks compared to touchpad, which was marked as least preferred. Abstract: The paper introduces Stripe, an interactive continuous scale for online surveys that makes it easy to compare multiple answers on a single screen. The Stripe is evaluated as an alternative to the n-point Likert scale, which is commonly used in online usability questionnaires like the System Usability Scale (SUS). The paper presents the results of a user study, which confirmed the validity of results gained with the proposed Stripe interface by applying both the Stripe and the Likert interface to an online SUS questionnaire. Additionally, the results of our study show that the participants favor the Stripe interface in terms of intuitiveness and ease of use, and even perceive the Stripe interface as less time consuming than the standard Likert scaled interface based on radio buttons.